The next day or so, he brought me an ancient IBM model M keyboard he had lying around. It's a wonderful piece of mechanics (yes, mechanics, not - or hardly - electronics). 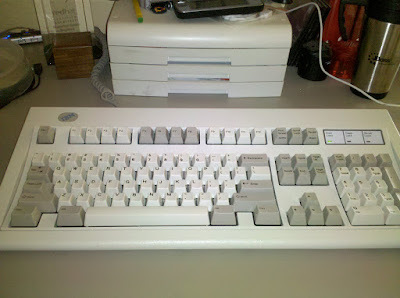 According a Wikipedia article about the Model M, this one is approximately between 15 and 18 years old. 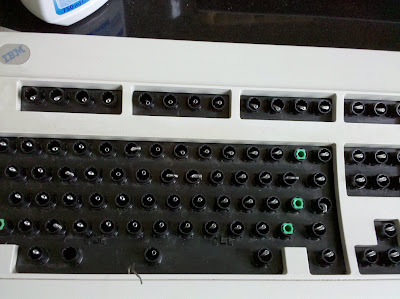 Between the time this keyboard was made, I have gone through at least 2 Microsoft Natural Keyboard Pro's, a Microsoft Natural Keyboard Pro OEM, a wireless piece of Microsoft keyboard junk, some Logitech PoS and another, slightly bent, Microsoft keyboard. Strangely, as much as I am a Linux fanatic lover, I kinda like Microsoft's hardware. Maybe they should specialize in that and leave making operating systems to the adults. ;-) But even though I liked some of the above keyboards (especially the Natural Keyboard Pro's), they all pretty much died under the heavy usage I submitted them to. This IBM wonder here is way, *way* older and still functions brilliantly. The only downside is the noise it makes when used, but that's of course also part of it's high cool-factor. Anyway, the Model M my buddy gave me was old. Dirty and old. So I have been looking for an opportunity to clean it and last Sunday, it finally arrived. Next, armed with a kitchen rag and some nice chemical kitchen cleaner, I viciously attacked the dirt on the keyboard, but not before having dealt the first blow using the almighty vacuum cleaner. This left my keyboard in a fairly clean state. After I popped off all of the letter caps from the plasic feet they're attached to, I just dropped all of them in the sink and drowned them with hot water and Dreft. Dreft always delivers :-) When I fished them out, they were mostly clean, so I just left them to dry on an old towel in the study. 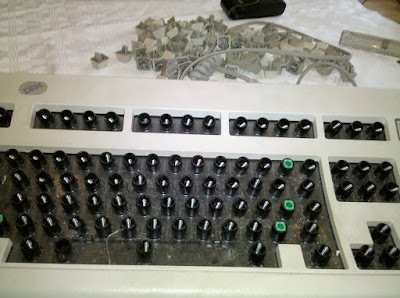 A good 20 minutes of puzzling later, I had myself a pretty, clean, working and noisy IBM model M keyboard. I love it. 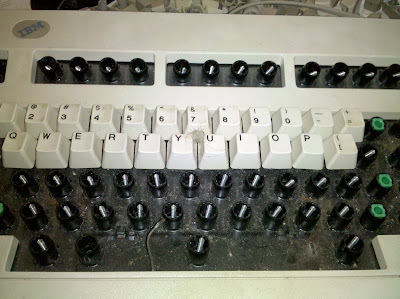 I'm typing this post on it now (the main reason I'm writing this is to check all the keys and whether it feels right. It does, btw). Jeroen, thanks man. Nothing beats the Model M!